What is the Mt. Tabor Road Restoration and Pedestrian Safety Project? The Mt. 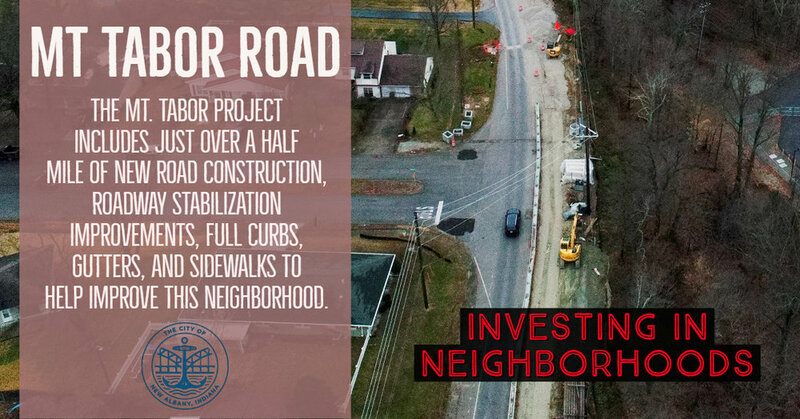 Tabor project includes just over a half mile of new road construction, roadway stabilization improvements, full curbs, gutters, and sidewalks to help improve the neighborhood. 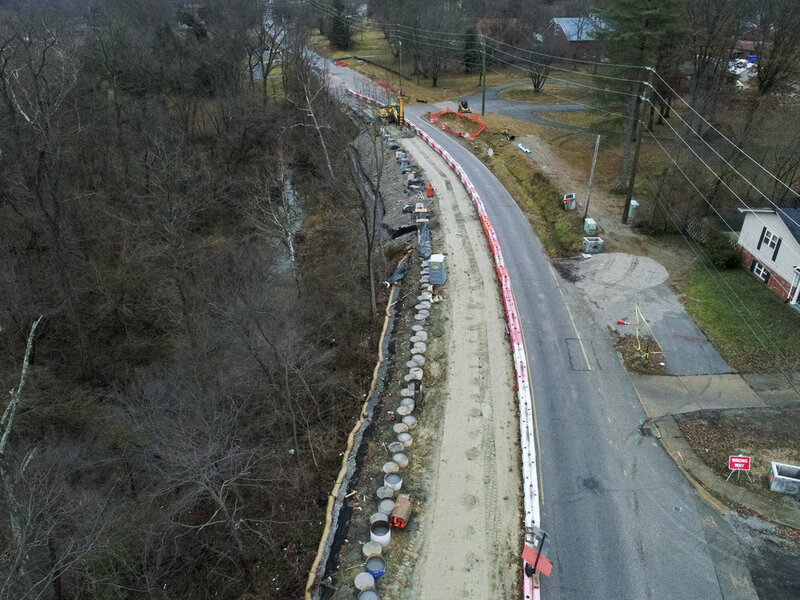 The need for this project is clear, considering the renewed surface cracking and foundation shifting occurring near the Slate Run creek slopes, along with the lack of any pedestrian facilities along the roadway. This project will provide a much needed reconstructed road that will aim to stabilize and provide a long-term solution to the road-erosion issues, as well as improve pedestrian safety and provide traffic calming mechanisms. In 2013, a slide occurred on the hillside of Mt. Tabor Road. The City provided a temporary solution to the road failure and erosion issues at that time, and this new federally funded project (80% federal funding, 20% local funding) will ensure that a long-term solution is in place that keeps residents and families in the neighborhood safe. The total anticipated cost for this segment of the Mt. Tabor road reconstruction project is about $3.1 million, with the city’s 20% totaling about $620,000. The city is utilizing drilled shafts to help stabilize the roadway. A drilled shaft system is constructed by drilling a borehole, placing reinforced steel into the drilled shaft, and then filling the remainder with concrete. This system helps form a strong retaining wall that will resist further movement of the roadway and hill. 20 foot long (or longer) drilled shafts being installed into the hillside to help stabilize mt tabor road. Drilled Shafts and new drainage infrastructure are being installed simultaneously. Week of April 1: Install Subgrade Treatment Type 1B (14” cement stabilization) in Phase A area between Klerner and the West Church entrance. Crews will then install #53 stone road base and curbs in North lane in Phase A area. Install sod at corners of Charlestown Rd intersection. Week of March 25th: Installed Underdrain for North Lane in Phase A area. Installed fill lifts of Borrow soil North of Phase A roadway. Installed remaining “Yield on Flashing Yellow Arrow” signage on Grant Line Rd spans. Prepped for curb installation for North Lane in Phase A area. Week of March 18th: Earthwork Fill and Subgrade Treatment Type 1B operations in Phase A area between Klerner and the West Church entrance. Temporary stripe crosswalks and stop bars across Charlestown Rd at N and South approaches on Friday, 3/22/19. Week of March 11th: Poured new curb and gutter, sidewalk, curb ramp, and DWS at the NE and SE corners of Charlestown Rd intersection. Installed temporary striping. Prepped for earthwork and Subgrade Treatment operations between Klerner and the West Church entrance. Week of March 4th: Mill existing pavement in Phase A area between Klerner and W Church entrance on Wednesday 3/6/19. A letter will be distributed to residents on Tuesday 3/5/19 explaining what to expect and how to enter and exit the neighborhood. Driveways will be created using compacted stone during the milling operation. Continue Storm Sewer install (Storm Sewer will be complete this week). Install new curb and gutter, sidewalk, curb ramp, and DWS at the NE and SE corners of Charlestown Rd intersection on Thursday 3/7/19. Temporary lane shifts (same as approved at 1/15/19 BOW) to be utilized as necessary in the outside lane of Charlestown Rd. Only one lane will be shifted at a time (NB or SB). A Lane Shift sign, an arrow board, and delineators will be set up per MUTCD for these lane shifts. Will occur between 9:00 AM – 3:00 PM. Week of February 25th: Installed new curb and gutter, sidewalk, curb ramp, and DWS at the NW and SW corners of Charlestown Rd intersection. Removed old curb and gutter, sidewalk, curb ramp, and DWS at the NE and SE corners of Charlestown Rd intersection. Activated new traffic and pedestrian signals and removed old signal equipment at Grant Line Rd intersection. Week of February 18th: Storm sewer installation continues throughout the corridor. Curb and gutter installations will be ongoing at NW and SW corners of Charlestown Road intersection. Temporary lane shifts will be utilized as necessary in the outside lane of Charlestown Road (only one at a time, northbound OR southbound). New signals are expected to be open on Thursday. 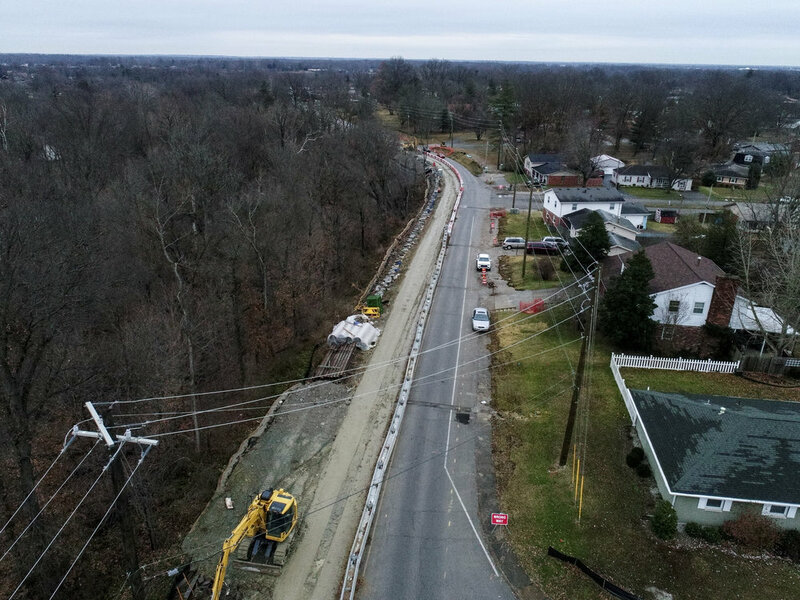 Week of February 11th: Beginning on 2/25/19, and running through approximately 5/14/19, the roadway (from Klerner Lane to near Mt. Tabor Presbyterian Church) will be closed to thru traffic. Residents in the work area will still be able to access their homes. We know that construction projects are a hassle for neighbors, and that’s why we are doing everything we can to get this project done quickly and efficiently. Recently, construction engineers came to us with a way that we can shave two (2) full months of construction time off of the project, but in order to get this done, we have to close part of Mt. Tabor Road to thru traffic. While construction projects like this are never fun, we believe that the stabilization of the roadway and safety of all those who travel and live on it is of paramount importance and must be repaired. We are hopeful that this project can be fully completed by late Summer / early Fall 2019. Week of February 4th: Signal work and ADA ramp installation will begin at the Grant Line Road / Mt. Tabor Road intersection. Temporary lane shifts will be utilized as necessary in the outside lanes of Grant Line Road. Only one lane, either northbound or southbound, will be shifted at a time. Work will occur between 9 am - 3 pm, weather dependent. Drilled shaft installation continues this week. Remaining storm sewer work (besides in the drilled shaft area) will be completed next week. Week of January 28th: Drilled shaft installation continues along the roadway, along with signal work at the Grant Line Road/Mt Tabor intersection. Temporary lane shifts will be utilized as necessary in the outside lanes of Grant Line Road. Only one lane, either northbound or southbound, will be shifted at a time. Week of January 21st: ADA Ramp installation at the corners of Charlestown Road and Mt Tabor Road intersection began. Temporary lane shifts were utilized as necessary in the outside lanes of Charlestown Road. Work continued on installation of more drilled shafts. 3540 feet of signal cable was installed. Storm sewer work is nearing completion. Week of January 14th: Crews continue to work on both the storm sewer installation and the installation of more drilled shafts to help stabilize the roadway. Depending on weather, crews may begin installing ADA ramps at the corners of the Charlestown Road and Mt Tabor Road intersection. If the weather does not cooperate, the ADA ramp work may be moved to next week. Week of January 7th: Crews installed 15 more drilled shafts along the Slate Run Creek hillside. Four drainage structures were also installed this week, along with 117 lineal feet of drainage pipe connecting the structures. Crews then backfilled and installed a riprap ditch.